Radio Magica applies the paradigm of open innovation to the field of education, bringing together various partners such as publishers, museums and associations. The web platform offers a web radio and a digital library for children and teens of all abilities between 0 and 13. Contents aim to support inclusive educational activities. Four mascots (fish, hedgehog, eagle and lion) help distinguish levels of content richness. A text in symbols for children with language problems connected to issues of autism. One of last year’s projects, which Radio Magica was able to promote thanks to sponsors like the Vodafone Italia Foundation, a contribution from the Veneto Region, and a partnership with the Fondazione Musei Civici, Guggenheim Collection of Venice and the University of Venice Ca’ Foscari is called “Radio Magica Libera Tutti!” (Radio Magica Frees All!). This project’s mission was to guarantee that children had access to the artistic heritage of the Veneto region. 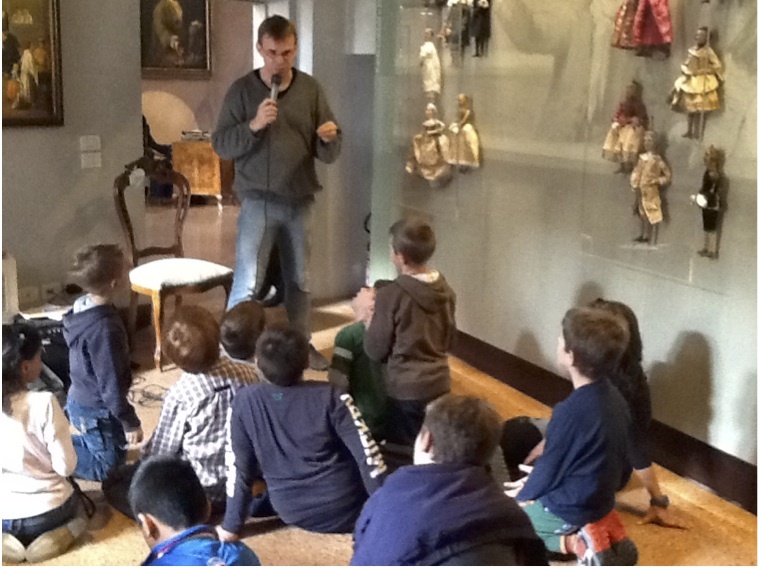 Sixteen adventurous stories set in various museums across Venice and the islands, were written by the professional children’s book author, Luigi Dal Cin. After the stories were completed, last October 2013 Dal Cin led eighteen creative writing labs for children 8 to 12 years old. The labs were hosted in the museum where the different stories were set to allow children to actively contribute to creative storytelling. Children with and without special needs participated in the labs and offered new ideas and suggestions to the plot. After a final revision by Radio Magica media professionals and museum curators, these stories were audio produced with the collaboration and work of professional actors. Together with the audio recording, the non-profit organization was also able to commission a video production with Italian Sign language (LIS) that was set in the Venice Natural History Museum. This video production was the result of many different collaborations including the author of the story Luigi Dal Cin, the Gruppo Alcuni director Sergio Manfio for the video production, the LIS consultants Livia de Paolis and Carmelina di Bella, the museum director and curator, Luca Mizzan and Margherita Fusco, the University of Ca’ Foscari Research Fellow Giovanna De Appolonia and the Radio Magica team (Elena Rocco, Agnese Ermacora and Francesco Candura). You can watch the video here. Children learning experiences are often the opposite of fun, but new technologies and the so-called web 2.0 can turn learning into imaginative, creative, pleasurable and most of all inclusive activities. The output of this video production was the involvement of all children and particularly those with special needs. In fact, the narration with the Italian sign language (LIS) is not only useful to hearing impaired children, but also to young children and those not speaking Italian while, at the same time, the audio can be beneficial to blind or visually impaired children and the animations can help those with language problems connected to issues of autism. Finally, captions with high readability font can help children with dyslexia. One more output comes from the fact that, once shared on the web and on social networks, such a digital production allows the museum to reach out beyond the region, gaining a national and international visibility. Finally these audio recordings of storytelling have the potential to become app-books, e-books, and books supporting the inclusive dissemination of cultural heritage. Radio Magica and its collaborators expect great benefits from the application of storytelling to the Cultural Heritage for both children and adults. Moreover, they believe in the importance of using storytelling to welcome young visitors and introduce them to museum collections. It isn’t true that children only enjoy some kinds of museums, namely children’s museums or museums of Natural History! With an age-appropriate introduction, children with or without special needs can explore any place, no matter if it displays paintings, glass artifacts, fossils, farmers’ tools or war guns. You can listen to the interview of Elena Rocco by the BBC here, starting from minute 27 and you can listen to the “Radio Magica Libera Tutti!” audio recordings here.